The original Super Mario Kart may be two decades old now, but it's still actively played on the competitive circuit, with yearly tournaments to establish who is the fastest SNES fan on four wheels. One of the world's most famous Mario Kart players is Sami Cetin, who is referred to by many as "The Godfather of SMK" due to his promotion of the title and previously-held world records. He's the current UK champion and has been training his niece, Leyla Hasso, since she was old enough to hold a joypad. You may have heard of Leyla before. She started playing Mario Kart when she was just 5 years old. The video below shows her remarkable journey. As you may have seen from our recent feature, the Play Expo 2012 recently took place in the UK, and Sami Cetin was asked to set up a Super Mario Kart tournament - which his niece duly won, beating Super Mario Kart Racing Specialist and big SNES enthusiast Paul Darbyshire in the final. The footage is shown below, filmed on Cetin's ageing DV camera (hence the less than perfect recording of the CRT TV image). That triumph bagged Leyla a golden SNES pad - but she was a long way from being finished. During the Play Expo weekend, she managed to break four Women's World Records in a single day, on Donut Plains 3 and Ghost Valley 3 Course and Best Lap times (see videos below). To the uninitiated, PAL and NTSC are television standards. The European PAL Super Mario Kart was slightly reprogrammed and also runs a little slower, hence the need for two different Super Mario Kart world titles. So there you have it - one of the world's best competitive Mario Kart players at the tender age of 13, and we have a feeling she's only just getting started! Hmm I'm entering a tournament in Sydney soon so I'll be watching these YouTube clips to get some ideas on how to tackle this! Wow, I was totally unaware that there was an ongoing competitive scene for this game. That's awesome. I was thinking about getting back into SNES gaming lately, too, so this just fuels my desire. I still have my original console and everything. @Chunky The one on the 1st of November? Amazing. Makes me want to break out the SNES and get playing again! Every time I hear something about SMK, I just have to load it up and have another go! Will you marry me Leyla? Proud of you Leyla, you worked really hard for this, very well done! And all the best for future Time Trial record improvements and yearly Super Mario Kart World Championships. All: If anyone would like to know more about competing in Super Mario Kart SNES Time Trials or Championships please send me a message. Many thanks! That has got to take some real skill. The golden joy pad is also very snazzy. I'd probably come in last place. Why? The stupid B button is the accelerate button, when it should be A like it is in every other game. I always break and fall. And fall, and fall, and fall due to these bad controls. Skillz (and a golden SNES controller), she has them. Check us out on the Super Mario Kart Time Trial World Rankings guys, the link is available at the end of her World Record videos above, can be easily found on google too. There are many more skilled players and amazing records + videos. I have to say that even though she beat me, it was almost an honour to watch someone that skilled in action...almost!! I'll be back next year to get my revenge!! Phenomenal SMK player! Also, does anyone out there know if there are any competitive tournaments for Mario Kart 7? There are online ones that are on and off, but not sure on major World Tournaments on the other Mario Karts. The SNES Super Mario Kart one has yearly World Championships in France. We have held some smaller ones in the UK also. Depends how far you are? Just have to check online, there are various groups around the world doing events, the multiplayer on the newer version of Mario Karts has more randomnised items though. The 1 to 1 competition on Super Mario Kart snes really gives you a chance to show driving skills and tactics. If you did want to see the World Championship in France it happens annually in August. The golden control pad was actually a prize Sami Cetin won on the RetroCollect competition at Play Expo. @SamiCetinSMK Good to know! May have to plan a vacation around that time. Also, since you brought up the topic of original SMK vs newer versions, I wanted to get your personal, and professional, opinion on the Mario Kart series. Which is your favorite and which one comes closest to it? Personally, I agree that the newer versions have more randomized items. Also, the more players involved do make it a bit difficult for one to show off their driving tactics and skills. But I also believe that the latest version has the randomness balanced. By that I mean that if one is skilled enough, not even an abundance of blue shells can derail one from losing first place. And the return of the coins is the icing on the cake! I'm really glad they brought it back! With that said, what's your take? I would say that Time Trial in all versions in fine in its own way as items arent there. Just depends which style fits you more. SMK and MKSC were two of my strongest ones as they are alike on handling mechanics. Mario Kart 64 was good for Time Trial and DS / MK7 too. For mutiplayer racing i would put SMK clearly on top, and Mario Kart Double Dash I observed was fairly balanced from a Tournament i was at in Norway, although i dont play this version much. @SamiCetinSMK Thanks for replying! It's always great to hear an opinion from a Mario Kart veteran! After this, now all I'm in the mood for is some Super Mario Kart. Unfortunately, I don't have a SNES nor WIi any longer. But I do have Mario Kart Super Circuit on my 3DS Virtual Console so I think I'll give it another go! Besides, if I play it long enough I'll unlock the old courses . Thanks again and congrats to Leyla for all her success thus far! Yes the controller was from RetroCollect which I acquired earlier in the day. A very nice collectors item. RetroCollect's team made some great challenges at the Play Expo and also big fans of the 16 bit era. Please do check out their Facebook page when you can. SNES's are cheap on ebay, where are you from exactly? You can pick up a copy of the native version PAL or NTSC then compare records to competitors around the World. To be serious, that's awesome for her! Well done, Leyla! Oh wow, I can barely play the game properly. ... Now I feel like playing super circuit on my 3DS. After playing: Yup I'm still bad at it. @SamiCetinSMK any advice on Super Mario Kart time trials would definitely help me out! It's rather heartwarming to see young people playing the gems today we played when we were young. I looked up and apparantly its going to be on Mario Kart 64 on that Sydney tournament? Different game if so... But otherwise hit some Time Trials on whichever game it is to improve the driving techniques prior to the event. It's amazing how I still haven't played this game. Thanks for the advice, I'm slowly bettering my times! @SamiCetinSMK from what I can gather, the 1st round of that comp in Sydney consists of playing either SMK, MK64, MKDD, MKWii or MK7. Then the finals consist of racing in MK7. But anyway I've got a few questions for you, if you don't mind answering them. On average how many hours of SMK per day or week has Leyla played to get to this level? If you feel like that's a "trade secret" then may I ask if she plays the other MK games regularly, or if she has time to play other games & if so what's her favourite game outside of the MK series? Just curious as its insanely amazing how she can become so good at a game at such a young age, tearing through the tracks like she's a player far beyond her years. Simply awesome to watch! NL should interview her for the "Ninterview" series. .......I think I'm in love. Well she revs my engine. Sure, fire away on any questions, il answer those. Infact Leyla usually only plays once a week, or maybe a short second session. Maybe 2 hours in a session but we have kept it consistent through the year. As mentioned it is advantageous if i am tutoring her while she plays as she can see live demonstrations, but in the end of the day it is up to the player to figure out the controls and cornering techniques and refine them themselves. She attended the Super Mario Kart World Championships in France also this year and after playing multiplayer with 40 or 50 of the Top players in the World from around 8 countries this helped her visualise how to improve and drive certain tracks. So basically play vs good players if there are any locally and watch some time trial videos and replicate the best you can what is being done. If you do want to join one of the Time Trial sites look them up like super mario kart. Once you become a good driver you will in turn become a good multiplayer racer as you can use the driving skill as a weapon. This works best in the original Super Mario Kart as the game is less focused on getting multiple blue shells, bullets etc etc that the new versions have. More driving technique and balanced item use. She has played Mario Kart Super Circuit, Mario Kart DS, MK7 and MKWii briefly but only for recreation and not any advanced driving or Time Trialing. Super Mario Kart was the only one she pursued as it was my favourite also and easier to pick up on Time Trial. If you see the first video it will show how shes started young, but she did have long periods where she didn't play at all. This year was the one where she made a massive comeback. She also drove a consistent Mario Circuit 1 time of 1'02"16 which beats the long standing Women's World Record of 1'02"18 set by Sue Cladingboel back in around 2000! 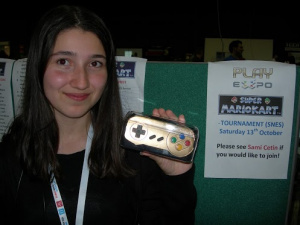 Leyla now holds all 40/40 PAL Women's World Records for Super Mario Kart, and has climbed to 13th in the whole of the UK and 93rd in the World on the PAL rankings. I hope there will be more opportunities and interviews for her, and there should be some more interesting news next year. You can find her speedrunwiki on google easily for further information.